When should you switch chickens to layer feed? 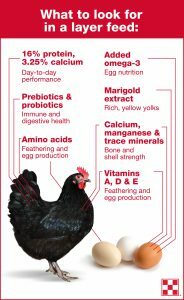 For backyard chickens, most egg-laying breeds reach adulthood at 18 weeks and lay their first egg— perfect timing when you can start your chickens on layer feed. There are many complete layer feed options available, from Purina including: Purina® Organic layer feed, Purina® Layena®Plus Omega-3 and Purina® Layena® pellets and crumbles. This entry was posted on Wednesday, September 12th, 2018 at 5:10 am	and is filed under Chicken Chat, News & Updates. You can follow any responses to this entry through the RSS 2.0 feed. Both comments and pings are currently closed.